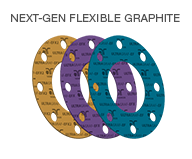 Safer Edges: UltraGraf’s Flexmet™ insert with greatly reduced sharp edges minimizes the likelihood of cuts when handling and fabricating gaskets. Easier to Cut: Flexmet™ insert is significantly easier to hand cut compared with tanged insert saving time, effort, and material waste. 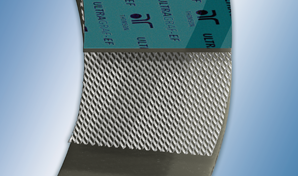 Updated Surface Finish: results in a more robust and less fragile gasket material. Uniform Loading: The geometry of the Flexmet™ insert promotes more uniform loading and greater load retention over time. Anti-Stick Technology: Gasket removal is made easy with Thomson Sure-Release™ Anti-Stick technology saving valuable time and energy. Utility Grade Sheet: High purity graphite for general service and moderate cycling service. Typical Service: Hot hydrocarbons, saturated steam and exhaust. General service grade for moderate conditions. Premium Grade Sheet: Higher purity graphite with oxidation and corrosion inhibitor for more extreme conditions and where cycling occurs. Typical Service: Hot hydrocarbons, super-heated steam, high pressures and cycling conditions. 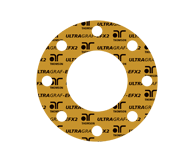 Maximum Performance Sheet: All EFX attributes, plus maximum oxidation resistance (>99% volume retention). 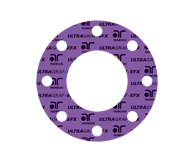 EFX2 meets the most demanding graphite specifications in the industry. Typical Service: Hot hydrocarbons, superheated steam, exhaust and extreme thermal cycling. Ideal for critical service applications.